The key to lasting beauty of your wood flooring investment is proper maintenance for the life of your floor. Included in this page are care guide lines, maintaining urethanes finishes, wax finishes, and the Do's & Don'ts of your wood floor product. ~ Follow manufacturer's recommendations if known. ~ Install floor protector pads on the bottom of all furniture. after the finish is fully cured. vacuums that have a special hard-surface setting). with urethane, and those that are not. mopping. as well as damp-mopping with a recommended cleaner. ~ Most finish manufacturers do not recommend wet mopping. ~ Never use a household dust treatment. ~ Never use wax on top of a non-wax surface finish. ~ Wipe up spills immediately with a lightly dampened cloth, then follow up with a recommended cleaning product. cleaner or a hardwood floor cleaner. Apply directly to the stain and repeat as necessary. ~ Never use petroleum-based cleaners on waterbased finishes. o When the floor loses its luster, it's time for a recoat. ~ Never use a water-based cleaner on wax floors. ~ Wipe up spills immediately with a dry cloth. This may dull the area. 50 buffing may be required. spirits. Rub gently in a circular motion until the spot is gone, then rewax the area and rebuff. flooring manufacturer - not doing so can void the floor's warranty. confident calling you when it's time for a recoat. Customer should make a note of this on the inside door or shelve of their cleaning product closet/area. 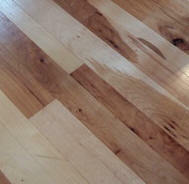 Always follow the manufacturer's recommendations (when known) for the proper care of a wood floor. 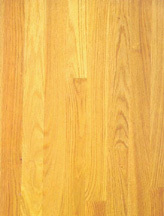 Know the type of finish on the wood floor. Follow the proper maintenance procedures for the particular finish. Never wax a urethane floor. A majority of floors installed today have urethane finishes. Never use sheet vinyl or tile floor care products on wood floors. Self-polishing acrylic waxes cause wood to become slippery and appear dull quickly. The only remedy in this situation is to sand and refinish the floor. Consult with an installer, the finisher or the manufacturer if there is any doubt of the kind of floor finish. Place mats and throw rugs at doorways, exteriors and interiors to help prevent the tracking of grit, dirt and sand. Sweep or vacuum wood floors regularly. Never wet-mop a wood floor. Standing water can dull the finish, damage the wood and leave a discoloring residue. Wipe up food and other spills immediately with a dry or slightly dampened towel (wipe dry). For a wax floor, buff to restore shine. You may want to invest in a buffer. Do not over-wax a wax floor. If the floor dulls, try buffing instead. Avoid wax buildup under furniture and other light traffic areas by applying wax in these spots every other waxing session. Put plastic or fabric-faced glides under the legs of furniture to prevent scuffing and scratching. Remember: cleats, sports shoes and high heels can dent any floor surface. When moving heavy furniture, protect wood flooring by slipping a piece of cloth or pile under the legs or covering each leg with a heavy sock or half of a milk carton. For wood flooring in the kitchen, place an area rug in front of the kitchen sink to catch sink splashes and cut down on wear.